Chelsea and Tottenham met last Saturday trying to win the upper hand for the remaining matches in order to get the much-sought 4th place and respective Champions League place. However, the fear of losing was clearly far too great for both teams, which meant we were presented with a very cagey match, with the best scoring chances coming both from set pieces. Chelsea started without Meireles, Luiz, Torres and Ivanovic, whereas Tottenham were without Lennon, which brought van der Vaart to the right wing when for his defensive duties. Harry Redknapp's team sat back and soaked up the pressure, and Sandro was instructed to push higher up to break up Chelsea's first area of build-up play. As for Roberto Di Matteo, his main concern seemed to be the threat of Gareth Bale, telling Ramires to help Bosingwa out and always create 2v1 situations against the Welshman, which rather explains the little impact he had throughout the match. The midfield duo of Essien and Lampard was predictably slow, despite Essien's increasing combativeness. With Ramires stationed on the right, Sturridge was pushed to the left and Mata behind Drogba. The English winger is clearly least effective on the left, because he can't make his preferential move and drift inwards, and the Spaniard feels less comfortable starting from the middle, because it means he is always the subject of a centre-back or holding midfielder's attention, instead of surprising them. 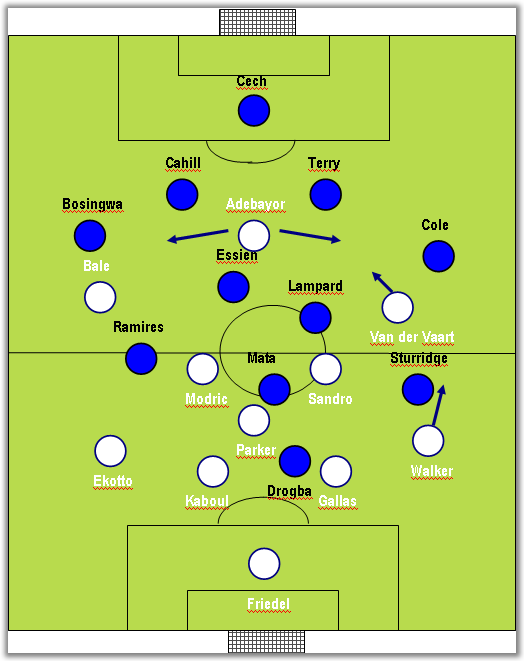 Di Matteo's men had a clear offensive plan: take advantage of Lampard's presence and going for balls over the top, either for Sturridge (going into the space opened up by Drogba) or Drogba himself, always likely to thrive on scraps. Close to half-time, Tottenham pushed a bit further up and made the game more interesting, coming close to scoring. In the second half, both Bale and Van der Vaart were brought to the centre, choking Chelsea's midfield. Besides, Redknapp's team were more comfortable with the result and, therefore, were more patient shuffling the ball from side to side. Chelsea, in turn, were always capable of wreaking havoc every time they threw long, diagonal balls behind Tottenham's backline. On 75 minutes, Torres came on for Essien, suggesting Chelsea would go all out. Just like it had happened on the home match versus Arsenal, the blues lost the game plot, became disjointed and were closer than ever to losing the match. All in all, it was a rather uninteresting match, even as far as tactics go, in clear contrast to what have been the match-ups between the top 5 English teams - high-scoring matches, with caution thrown to the wind. Neither team wanted to lose this game and ruin their chances of getting access to next year's Champions League.